The kids are back in school and we’re slowly settling back into the school routine. That is to say everyone is staying up too late and having to get up too early so no one is getting enough sleep. It’s fun. Some mornings, the kids sleep in until the last possible second and breakfast is grab and go as we rush out the door. 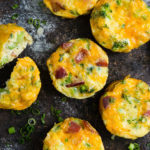 For that reason, I wish I could serve these mini breakfast frittatas every morning. They travel well – especially helpful for those mornings when we’re eating breakfast in the car (no silverware required and no crumbs). They’re somewhat healthy. Yes, there’s bacon (it is breakfast after all), but there’s broccoli too. Most importantly, my kids love them which means they’ll eat them and I know they’ll get a good hearty start to the day. I usually make the frittatas the night before, cool them, and then put them in the refrigerator overnight. In the morning, I can warm them up in the microwave for a quick breakfast. Of course, they are best when they first come out of the oven in all their beautiful puffed-up glory but I’ll take convenience over perfection on weekday mornings. If you have more time in the morning, you can prep the broccoli, bacon, and onions the night before and assemble and bake the next day. If you happen to have some cooked broccoli left over from dinner, definitely use them to make the prep for this recipe is even easier. Maybe one day, we’ll figure out this get up in time to get ready for school AND still eat breakfast at the table thing but until then, I’ll keep these mini breakfast frittatas in our regular rotation. Generously coat 8 standard-size muffin cups with cooking spray or butter. Set aside. In a small skillet, heat olive oil over medium heat. Add green onions and sauté until onions are tender. Transfer onions to a medium bowl. Set aside. Return skillet to the heat and add broccoli florets. When broccoli begins to soften, add a few teaspoons of water to help cook the broccoli. When broccoli is tender-crisp and water has evaporated, season broccoli with salt and pepper. Divide broccoli evenly among muffin cups. Wipe out the skillet and return pan to the heat. Add bacon and cook bacon until crisp and lightly browned. Transfer bacon to paper towels to drain and then divide bacon evenly among muffin cups. Crack eggs into the bowl with the green onions. Add milk, salt, and pepper; stir with a whisk until well combined. Divide egg mixture evenly among muffin cups. Sprinkle cheese evenly on top. Bake for 15 to 20 minutes or until just set. Cool on a wire rack for 2 to 3 minutes; run a thin knife around edge of each frittata to release from pan. Remove frittatas from pan to serve. If there is excess water on the broccoli, pat the broccoli dry before adding them to the muffin pan.